Mrs. Bertha Barret, Mrs. M. Neighbor and Mrs. H. Nieman, officers of the Canadian Daughters League. Barret, BerthaNeighbor, Mrs. M.Nieman, Mrs. H.
Edmonton Police Amateur Athletic Association tug-of-war: (L-R) Pete Tyler, Joe Lamoureux, Jack Wakeford, Ron Hooper, Bud Ward, Don McNaughton, C. W. "Red" McNicoll and Bill Sears. 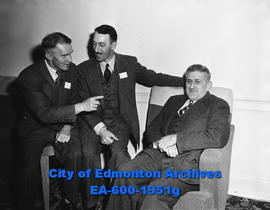 Members of the visiting Lions Club party on the steps of the Macdonald Hotel as Mayor Harry Ainlay, foreground, presents Bruce Malcolm and Stan Fowler with a key to the city. 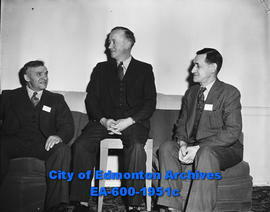 Left of the Mayor is T. G. Derrington and right of Mr. Fowler is A. G. "Shorty" Kirstine. Macdonald HotelAinlay, Harry D.Malcolm, BruceFowler, StanDerrington, T. G.Kirstine, A.G.
St. David's Welsh Society banquet. Tawasi Club members. Walter Coxon. Tawasi Club members. Heather Jean Begg. Tawasi Club members. Loretta McLean.